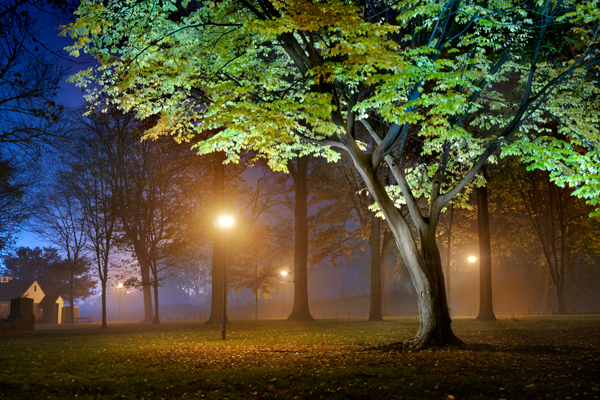 This foggy evening found me in the quaint town of Lititz,Pa doing a photo shoot for a friend at Wilbur Chocolate and when I came outside to leave I was struck by the serenity of the neighboring park with its lamp posts glowing in the fog. I spent almost two hours roaming the park in the quiet of the night taking photos and saying hello to the occasional person walking through this mysterious setting. Lititz,Pa has a certain intangible quality that draws you in and makes you feel like you are in another time. A lucky break happened this night because the local high school band was practicing in the field in the distance and they had large portable floodlights which added the blue effect in the distance that contrasted with the warm lamp-post lights. Lititz Pa earned the distinct honor of being named Americas Coolest Small Town this year, and there are a variety of reasons for this accolade. From the small town charm, to the businesses that are an integral part of the community, to the residents that take pride in their town, lititz is one unique place that beckons visitors to return over and over.One of the attractions that draws visitors to Lititz is Wilbur Chocolate,which is famous for Wilbur Buds as well as countless other confectionary delights. 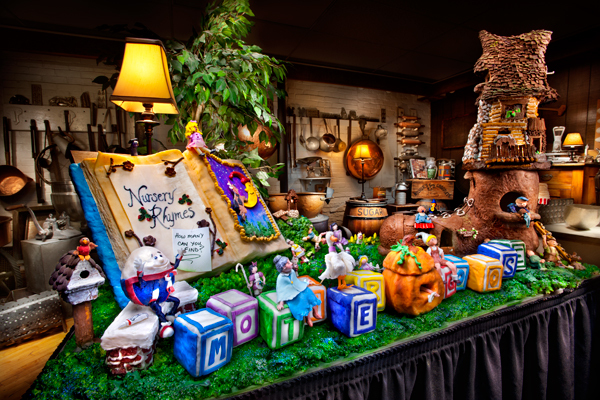 The amazing display shown above is thanks to the creative genius of Chocolatier Kathy Blankenbiller of Wilbur Chocolate. Kathy spent countless hours making this masterpiece of nursery rhyme characters for the annual Lititz Chocolate Walk held on Columbus day weekend. It is currently on display in the Wilbur chocolate store,and is showcased against a backdrop of antique chocolate making items. Kathy says the entire thing is edible and includes modeling chocolate,royal icing,licorice,Rice Krispie treats and more,and depicts at least 13 nursery rhymes plus a few jokes thrown in.I saw the dazzling display when visiting the store and inquired if I might record the masterpiece and the fine folks at Wilbur were very accommodating in allowing me to undertake this project.I cant wait to see what next years creation might be,but you can bet with attention to detail like this piece exhibits,it will be inspiring. 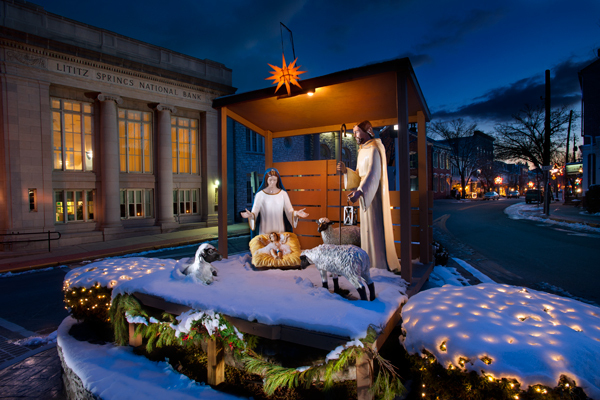 This nativity is located on the square in the town of Lititz,PA, and a few years ago someone complained and the ACLU got involved trying to ban the display. Thankfully the land is owned by the Church and the ACLU and its misguided agenda were sent packing. Wishing all my loyal blog followers a Merry Christmas. A fresh snow blankets the sleepy little village of Lititz,Pa on a quiet night. 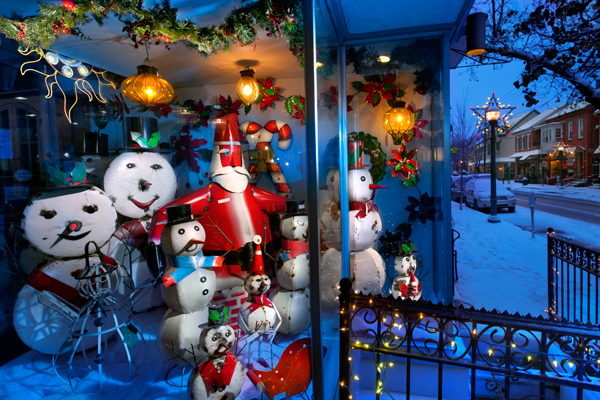 These poor snowman and santa are trapped behind glass and wish they could get out to frolic in this winter wonderland. Finally found some time to visit Lititz,Pa again to capture some more shop scenes in the downtown area. 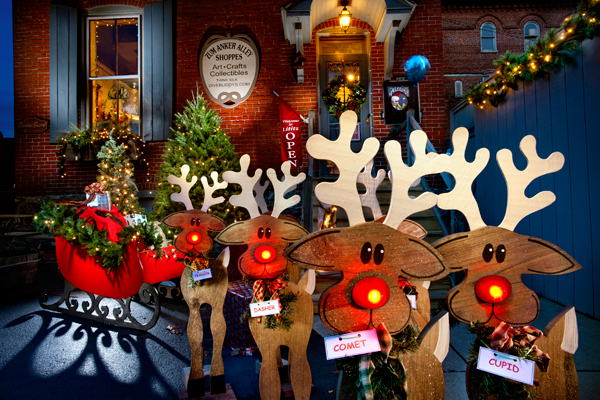 The first scene that caught my eye was this set of reindeer,complete with illuminated red noses and a sleigh with christmas packages behind them. I had to rush a bit because they put the reindeer away at closing time,which is just the time the light gets good. A few pops of the flash added a bit of interest to bring the scene to life. This was shot saturday and then it snowed on sunday,which would have added to the shot but this turned out pretty good despite no snow. 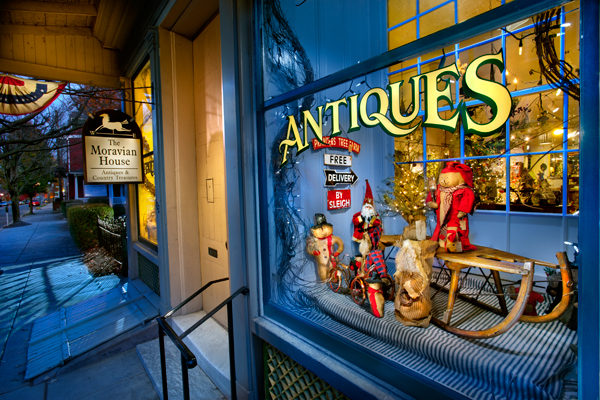 I was pretty happy with my result on this image featuring an Antique store called the Moravian House in Lititz,Pa. The hardest aspect was getting the word antiques on the window to glow and stand out.The shop owners remembered me from the past and gladly left me inside to fire my flash out through the letters from behind. This can be a rather complicated process to get the look I want,and changing camera white balance and getting the flash at the right angle help me get the color the way I envision it. 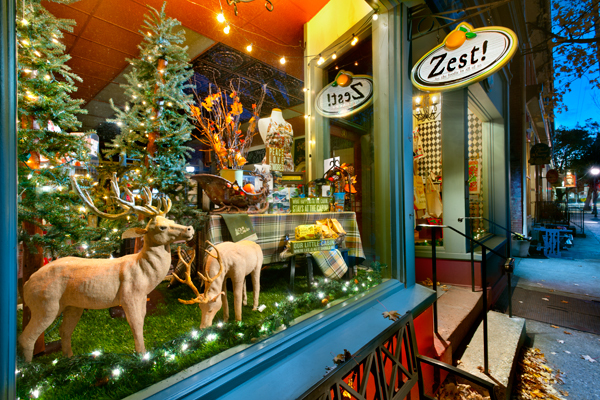 This is the time of year I really enjoy shooting store windows in the town of Lititz ,Pa. Lititz has a small town feel that just takes you back to a bygone era,and the stores get all decked out for the coming holiday season,which makes for a delightful evening walk through town. 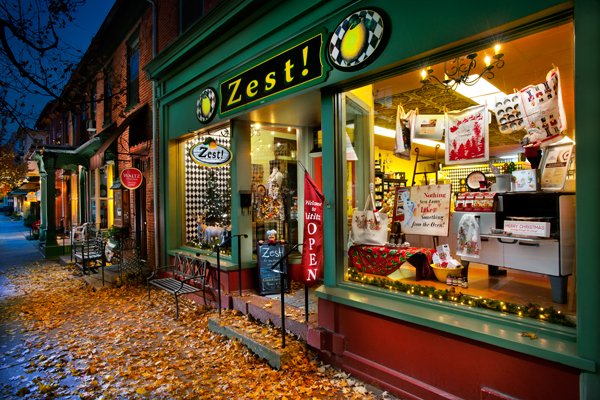 My favorite time to take photos is right around dusk,just as the shops are closing for the day.The quiet of nightfall in this sleepy little town is only enhanced by music emanating from the town square and with a little imagination you feel as if you were just transported to a Charles Dickens novel.This pair of images are of a store called Zest,and the owners always do a stellar job of decorating the windows. Light shining out from the store illuminates the freshly fallen leaves as the cool blue of dusk begins to envelope the street. Many stores are beginning to transition to the Christmas season,so hopefully I will find some unique subjects to share.